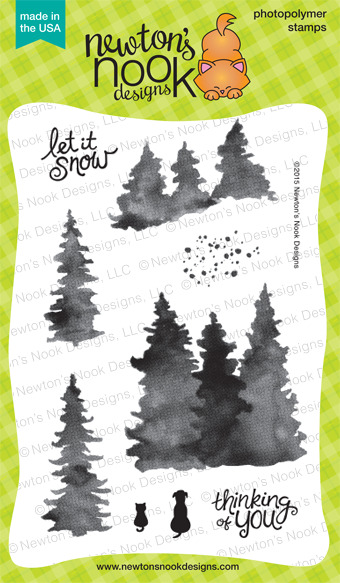 Newton's Nook Designs: Deck the Halls with Inky Paws Blog Hop! Welcome to our 3RD ANNUAL Deck the Halls with Inky Paws Blog Hop!! Make sure you scroll down to the bottom of this post to see the whole link list -- there are 16 awesome blogs for you to visit today! Plus you can comment for your chance to win a prize too! Details at the end of this post! 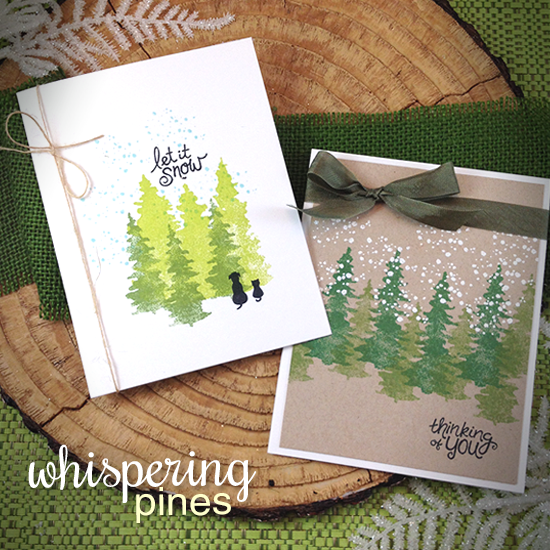 The blog hop starts here, with a cards featuring our BRAND NEW stamp set, just released today called Whispering Pines! This beautiful 4x6 tree set gives you the look of watercolor using your stamp and ink pad. These trees were watercolored by hand and then converted into stamps to give you that soft, imperfect painted feel. Try layering them and using different inks to create beautiful nature cards. And, because we couldn’t resist, we’ve added dog and cat silhouettes to add into your scenes! For my two cards I stamped the trees with green inks. For the left side card, I simply added some "snow" with light blue ink and the "let it snow" sentiment and cat a dot silhouettes too. I love how simple this is! A complete "one layer" card! For the card on the right I did a bit more layering. I added some snow on top of the trees that I embossed in white! So pretty! I also added the "thinking of you" sentiment on the bottom and fun green ribbon. Here's one of my favorite snapshots of him. Isn't he handsome? Make sure you check out all the blogs below as the whole NND Design team is participating along with some amazing guests! The next stop is Sandy Allnock! We will be choosing two lucky winners to win a $10 store credit for Newton's Nook Designs online shop! To enter, just leave comments on the Design Team Member and Guest blogs (see list below)! Two winners will be chosen at random from the collective blogs in the blog hop. Make sure to check out each of their blogs and comment for your chance to win. You will not know which blog has been chosen so the more you comment on the better your chances are of winning! You have until Sunday, December 6th at 9 pm CST to comment -- winners will be announced on the NND blog on Monday, December 7th. Absolutely wonderful stamp set and great samples of use!!! Love those watercolor pines!!! You can do so much with them! I just received my order! Love all of the images. The pine trees look really amazing!! Gorgeous set!! :) Thank you! I love that pine set. The dog and cat silhouettes are very cute, love the pine set. Aw the trees are gorgeous but I've completely been distracted by the picture of Newton, he is scrumptious. Wow the trees really look water coloured!! I love Newton!!! And love the tree stamps - they're gorgeous! These trees are gorgeous! And yes, Newton is one handsome guy. I'm a huge "cat fan" and have been "caring" for "God's cat garden" of feral cats in my neighborhood--two we have "tamed" and they come inside for treats and "luvs". We have neutered 15--and continue to feed them, even create a "shelter" for them when the weather gets cold. I am really liking the new set. Love the new release! Thanks for all you do. I can at least look like I can watercolor with that stamp set. Good job! Love the new set. I already can imagine so many uses for it, especially the tiny Newton and friend. Love the water color look! Really nice set! Beautiful card! Blog hop done! I loved everything!!! But especially this new stamp set. It's beautiful! I am fascinated with the 'watercolor' look. This stamp is awesome. Love the Whispering pines! I can think of lots of times that I've wanted a silhouette of a cat or dog - perfect. Love this stamp set and Mr Newton is a handsome devil! 🙏🏻Pray for Peace, people everywhere! Another set that reveals your flexible creativity, Jen...and you've captured the images of pine trees beautifully! I'm surrounded by them so I can say that with 100% accuracy! Your cards: soooo pretty! And Newton...purrrr-fect! Just found out about your stamps they are so cute love the picture of Newton. This is a fabulous new stamp! Love the little puppy and kitty silhouette images! Perfect touch! Gorgeous trees - great for 2nd generation stamping. Lovely trees, and what a cute picture of Newton, reminds me of my cat. Beautiful stamp set!!! Love it! Newton is too cute!! We have an orange kitty too! He was the runt of the litter, but is so sweet. This is such a cool idea for a stamp set! I love Newton! Love your card too. Beautiful cards. Love the stamps. Another awesome stamp set! Love the versatility of this set! I love the soft watercolor look of the trees. What a wonderful and versatile set. And since I have a dog and a cat, I'll be using those silhouettes a lot! Aww.. Newton is adorable. Reminds me of our Thomas. Thank you. ♥♥♥ The card is absolutely beautiful. Love the look of these new stamps, including the cat and dog. And yes, Newton does look handsome, but he still doesn't compare to our own ginger cats, called Vatsiko (male) and Kokkini (the queen of our pet family) lol. Awesome...love the whispering pines set! Newton is adorable! Love the new pine stamp! The pine trees are wonderful. So many different ways they can be used. Aww, Newton is such a handsome guy! I really like this new stamp set with the pines and cat and dog silhouettes. Looking forward to the hop! Great cards and I love the new trees! I agree your kitty is adorably cute! Newton is a sweetie! Just finished your blog hop and really enjoyed the inspiration. I especially liked seeing the cards made with the new Whispering Pines stamps - this is a great set! LOVE the Whispering Pines set! That photo of Newton is just too cute! Both of your cards are beautiful and I can't wait to see what the rest of the team created! I love the new stamp set. So many possibilities!! Your cat is very handsome. We have three in the house right now. I love cats!